Purpose: The Japan Society for Endoscopic Surgery (JSES) started Endoscopic Surgical Skill Qualification system (ESSQS) in 2003 in order to improve the safety of procedure, and carried out five examinations since 2004 up to 2008. We reported these 5 years’ results of cholecystectomy field in ESSQS. Methods: Assessment was performed by reviewing documents, laparoscopic surgery experiences, and qualifying unedited video tape by two independent referees. We adopted two criteria to evaluate surgical skills, as common and procedure-specific criteria to each gastrointestinal organ. 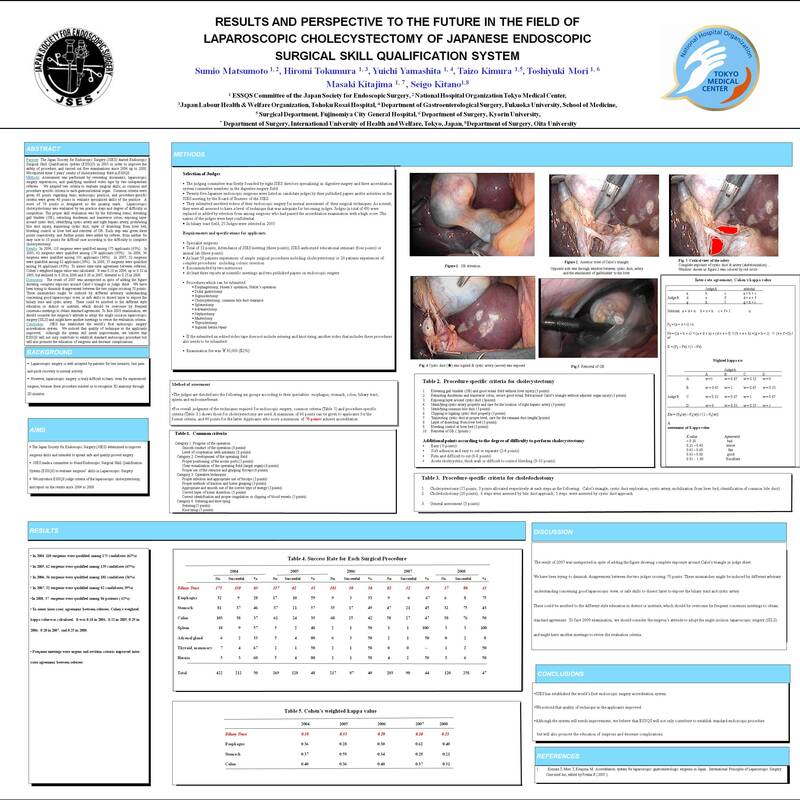 Common criteria were given 60 points regarding basic endoscopic practice, and procedure-specific criteria were given 40 points to evaluate specialized skills of the practice. A score of 70 points is designated as the passing mark. Laparoscopic cholecystectomy was evaluated by ten practice steps and degree of difficulty in completion. The proper skill evaluation was by the following items; elevating gall bladder (GB), retracting duodenum and transverse colon, exposing layer around cystic duct, identifying cystic artery and right hepatic artery, prohibiting bile duct injury, transecting cystic duct, layer of dissecting from liver bed, bleeding control at liver bed and retrieval of GB. Each step was given three points respectively, and further points were added by referee, from neither for easy case to 10 points for difficult case according to the difficulty to complete cholecystectomy. Results: In 2004, 110 surgeons were qualified among 175 applicants (63%). In 2005, Discussion: 62 surgeons were qualified among 139 applicants (45%). In 2006, 36 surgeons were qualified among 101 applicants (36%). In 2007, 32 surgeons were qualified among 82 applicants (39%). In 2008, 37 surgeons were qualified among 86 applicants. To assess inter-rater agreement between referees, Cohen’s weighted kappa value was calculated. It was 0.18 in 2004, up to 0.32 in 2005, but declined to 0.29 in 2006 and 0.20 in 2007, elevated to 0.25 in 2008. Discussion: The result of 2007 was unexpected in spite of adding the figure showing complete exposure around Calot’s triangle in judge sheet. We have been trying to diminish disagreement between the two judges crossing 70 points. These mismatches might be induced by different arbitrary understanding concerning good laparoscopic view, or safe skills to dissect layer to expose the biliary tract and cystic artery. These could be ascribed to the different style education in district or institute, which should be overcome by frequent consensus meetings to obtain standard agreement. To face 2009 examination, we should consider the surgeon’s attitude to adopt the single incision laparoscopic surgery (SILS) and might have another meetings to revise the evaluation criteria. Conclusion: JSES has established the world’s first endoscopic surgery accreditation system. We noticed that quality of technique in the applicants improved. Although the system still needs improvement, we believe that ESSQS will not only contribute to establish standard endoscopic procedure but will also promote the education of surgeons and decrease complications.